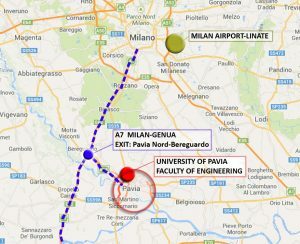 Our scientific campus is in the western part of Pavia. Pavia itself is located only 30 Km south of Milan, to which is connected by trains every 10 minutes. This is a map of our Campus. Please select full screen to a complete list of our facilities. Once you are off the plane and you are trying to reach Pavia you may decide to take a bus or a train. 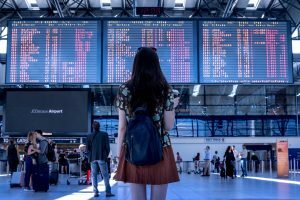 All the information about transport connection are on the airport website ( Milano Malpensa Airport; Milano Linate Airport; Milano Orio al Serio Airport ). Buy your ticket: For public transport usually you may find tickets at the newsagents. From the airports there are private companies connetting the ariport to the town and they usually sell tickets on board. Validate your ticket: when you are using a bus, tram or train in Italy, you have to validate your ticket: basically a little box machine will stamp the day and time on your ticket. If you take a bus or a tram, you usually can buy and validate you ticket ticket on board; if you take a train look for a yellow little box on the platform or train station and validate your ticket. If you forget just walk along the train until you find the conductor and let them know you have forgotten and you won’t get into trouble. As you probably already find out Milan has many train stations. 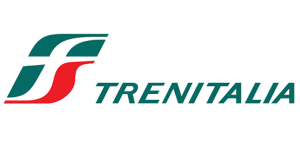 The Viaggia Treno website (http://www.viaggiatreno.it/viaggiatrenonew/index.jsp) is traslated in many languages and you can use the station search to find out which train are living from each station and all the stops they are going to do. This is useful when you take trains whose final stop is not Pavia. You can buy tickets on the train company website (Trenitalia): if you buy the ticket through this website you do not have to validate it. Read the website to find out more. Regional or Cross Regions Trains (they usually have an R before their identification number): they take 15 minuter to get from Milan to Pavia, but Pavia is not their final stop. Remember to get off. Long Distance train: Italy has a very innovative and rich system of long distance trains. The ones that stops in Milan and Pavia are called Intercity. Please note that the ticket costs more if you decide to take this train (double the price of S13 and Regioanls) but you will be assigned a seat and they usually have priority on other trains. Milano Greco Pirelli: Regional train going to Stradella (final stop) stops in Pavia but it is not very frequent. 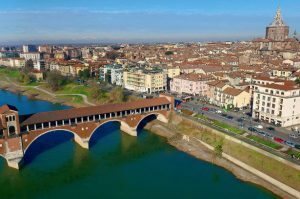 Once you arrive in Pavia you can reach us by taxi or bus. Usually you may find taxis parked in front of the station. There is also an app called Autoguidovie Pavia that you may use to buy your tickets. Please note that it is in Italian. The website is only in italian, try to use your browser translation system. Here there is a map of the bus tracks that may help getting you aroung: Bus Map. On the second page there is a list of all our bus line. Bus line n°3 and n°7 connect the train and bus station with our Scientific Campus. From the scientific campus you can take bus n°3 and n° 7 to go back to the station (all n°3 and n°7 stop at the train and bus station) or to go to the town centre. Check the map to verify where are the main stops. Same bus line to go and visit our central university in Strada Nuova. Users can borrow one of the 6 eviromental cars to move freely in the city centre (even in the restricted areas), park for free all over the the city and also use the bus lanes. More information here.